When you think of late 80s or early 90s Seattle in terms of music, one thing comes to mind: grunge. Pearl Jam, Nirvana, Soundgarden – all bands that were getting their start in that part of the country during that timeframe. Obviously many other acts were performing in the Pacific Northwest that weren’t grunge, but any band that saw success was lumped into that same category…whether they should have been or not. In the mid-1980s, then-drummer Layne Staley got his first gig as a vocalist when he auditioned for a glam rock band known as Sleze. The founding members were impressed, and they starting touring. Never quite picking up steam, they decided to change the band’s name, adopting Alice N’ Chains—with the playful N’ spelling hoping to remove any concerns with sexism. Despite the rebranding, their struggles continued and eventually the band broke up. Staley met fellow guitarist/vocalist Jerry Cantrell, and the pair joined a funk band in 1987. As you can imagine, a late 80s funk project wasn’t all that popular which led to yet another break up. That’s when all parties involved decided to back to what they knew; good old fashioned rock and roll. After tinkering with various names, a rebirth of Alice in Chains was deemed the best fit. 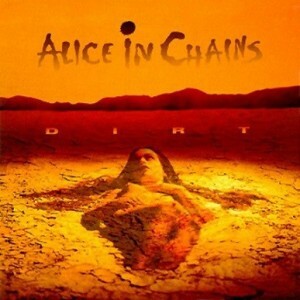 AIC’s first album came out in 1990, but today we’re looking at the second release, Dirt, which came out in September of 1992. With the success of the debut, the band found themselves dealing with the new fame, money and recognition the same as most rock bands, by turning to drugs. During the recording sessions of Dirt, it’s widely known Staley was using heroin, pain meds and other drugs, while the bassist and drummer were also doing similar. In spite of that, the band managed to churn out an album over a few months and it would be released to instant critical acclaim. It would go on to sell nearly five million copies worldwide. In my opinion, those that call this album (or Alice in Chains) grunge rock, are off base. Other than maybe the overall themes of angst and struggles, this album has a totally different sound and feel than those other bands I mentioned above. Staley and Cantrell’s dual vocals are something unmatched in rock history. The sound is heavy, in guitar, drums and vocals – and it makes you feel like you were right in there with the band. It’s generally very difficult for hard rock albums to convey an emotion, but this one certainly does. The drug use, self-loathing and openly honest despair the band felt, can easy be heard and felt through the record. The darkness and demons dealt with on the album, being so front and center was rare, even for that time. For a band that certainly doesn’t have the instant name recognition of many other 90’s acts, Alice in Chains put out really good music for a long time. They’ve sneakily sold almost 30 million albums worldwide, probably over double what anyone would have expected. Dirt may be the peak of the band’s albums, certainly worth $5 bucks.